These last few weeks have been great but heartbreaking in ministry. We have seen students pack their bags, have a party and then head off to college. Its great fun to see them grow up and head off to college but its tough to wonder how they will handle the world. I hope that we have trained up students to love God and like others. I hope that we have helped them learn how to connect with God on their own. I know that we have done our best that we can but there is still that thought that creeps in and wonders how they will do. If you have moved to go to college you need to get connected in a local church. Find somewhere that is fairly close to your school to attend. I think this is the first priority in your new endeavor in life. 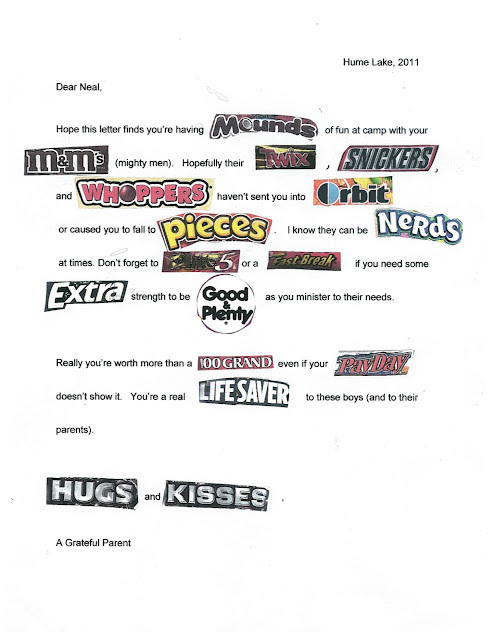 College is going to take up a good deal of your time and you need to get this piece in place ASAP. Once you find a church that you love make a commitment to that church. I have pushed many of you to serve here at South Hills so I want you to make that same commitment to the local church you are now attending. If you are staying here in Vegas "re-up" your commitment to South Hills and your area of ministry. I know this may sound like a resounding gong to read your Bible but you need to find a way to connect with God on a daily basis and this has been one of the best methods. Just this morning I was reading the Psalms and found some verses that identify the character of God. These verses help strengthen my faith! When you step onto a new campus there are going to be so many different things that you can get involved in. You need to start this journey off right and identify yourself as a Christian on your new college campus. This doesn't mean being weird or anything but it means standing up for what you believe in. The place that I have seen the most change in my life is when I am doing life with others. This could be called a: Small Group, Life Group, Growth Group or something else. Find out who leads them and get involved with one. Figure out a way to get connected with others in Christian Accountability. This list not an "all-inclusive" list but a starting point to keep your walk with Christ strong! Yesterday we baptized some very special students! Most of the students we baptized yesterday we have invested in for over two years. Some of these students gave their lives to Christ when they were freshman in our high school ministry. We have seen these students grow through out high school and seen them make some great choices as they have followed Christ. I do not want this statement to be misleading or degrading to anyone. I also want to be honest. I have fallen into baptizing students, and adults, that I wish I would have challenged to grow more in their faith before making this choice. This group of students were committed. Many of these students have passed up other baptism services because they were not sure if they were ready yet. They made sure that they were ready to live this life out and follow the choice they have made. For the life our our church we have typically baptized people outside the walls of the church building and I love that! Yesterday we did something different and I think it went so good! We took this group of students and baptized them inside our church, during our 11am service. We had our entire church focused on seeing this group make this commitment to God and I loved seeing that. As a pastoral leader I get a cool seat. Sometimes that seat is tough because I see the painful things from the front row and shield others from seeing that. Yesterday morning I got the best seat in the house. I was able to watch the water roll over these students faces and see their expression coming out of the water. I was able to give them their first hug as they exited the water. If you rewind four years I have also had the opportunity to see many of these students raise their hand and see their need for a savior. I am so thankful that I have had a front row seat to the life change in all of your lives. I love you guys. You can see more pictures of the baptism by clicking here. Last night was a very difficult night for me. Last night was the night that we shared with our students about some of the things that we have been working hard on, behind the scenes, to make South Hills a more effective church. Part of this will include a role transition for me. Starting September I will be transitioning out of student ministries and into a new role: Pastor of Discipleship. About two months ago I had a conversation with the leadership of our church and during that conversation I was asked to transition into this new role to help us grow the church. This new role is going to stretch me in some pretty big ways and as I have prayed through it I think it's going to stretch my faith also. About a year ago it became evident to me that our High School Ministry was functioning like a one-legged pirate. I shared this with leaders and students. Now one-legged pirates are cool and people want to see them and take their picture with them but they are not balanced. Our High School Ministry was not balanced in the Biblical Purposes and it was hurting our growth in students lives. This same analogy works for our church. Our church has a great week worship experience but we are lacking in discipling believers. As I move into this new role, initially, my main responsibility will be to build on what we currently have going in our Life Groups area. As we develop those, recruit more leaders and get more people in church involved them my role will expand. Some areas we have talked about would include: Missions (local and global), Spiritual Formation, and Accountability. I would really appreciate your prayers as we move into this new role and transition out of student ministries. I have spoken with our Elders at our church and the affirmation I have received from them is: "Neal, we think you are the only person on our staff who can do this." 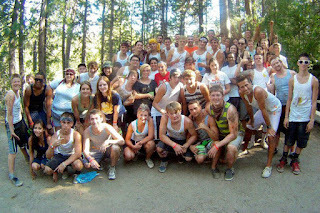 This summer at Hume the staff did something different. Honestly, at first, I was a little annoyed. I love going to Hume because they have an amazing program and I can trust what they are doing so my team and I can hang out with students. This summer as we went over the schedule the staff shared an addition to the schedule this year that would give each pastor 90 minutes to spend with just their church. Some ideas that were thrown out were to play volleyball together, to go to the cove or just do something with your church. At first I wasn't sure what to do so I needed to seek Jesus. After taking the night to think/pray about it I came up with the fact that our students needed to learn some spiritual exercises. I was pretty nervous because our ministry is very evangelistic focused and I felt that we needed to teach our students how to meditate on scripture using a practice that has been used throughout the church for centuries: Lectio Divina. I started out reading Psalm 46:10 and asked students to find a word in that verse. When you meditate on scripture it is helpful to use the Psalms but you can meditate on pretty much any scripture in the Bible. I have used this practice while reading the Gospels, Epistles and Psalms. You can take a few minutes on this part to read through scripture and while reading you find a word that grabs your attention and sticks out to you. Now that you have a word in your mind comes the fun part (it can also be the most difficult part). See we live in a culture that rejects down town and relaxation. Meditating on scripture is not something that we tend to encourage in the church. This can be difficult but very rewarding. After you have found the word take some time to meditate on that word. When your mind wonders just bring that word right back to the front of your mind and focus on that word and allow it to just speak to you. After you have meditated on that word for a couple minutes take some time to pray about that word. Ask God what that word has to do in your life right now, how that word can grow you in your walk with Christ and what could happen in your life if you would trust God more. This is a cool part that just causes you to pray specifically on that certain word. Now this is where it really gets cool. After you have found your word, you have taken some time to meditate on that word, you have prayed through that word for a few minutes now is when you get to do something that can be amazing: spend time with God. You just chill with God in this portion of the spiritual exercise. This is where you allow God to speak to you through your word and encourage you in what He would ask of you. Now its your turn to spend time with God and allow Him to speak to your heart through His word! This week I wanna take some time to dedicate this blog to some of the amazing things that God did while we were at Hume Lake! 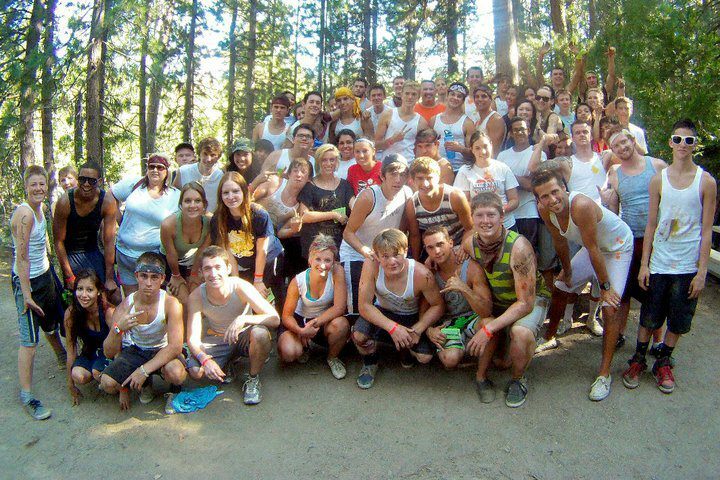 Every year we take some of our students to play paintball while at Hume Lake and this year was no different. The only change was that twenty minutes prior to paintball we had students mediating on God's word and getting super connected to Jesus right before they shot each other! So its the middle of the week and playing paintball on Wednesday afternoon this year was amazing! My first year of Hume Lake (summer 2005) some of the students said that the only way they would play paintball would be in shorts and wife beaters (tank tops). That has been the standard for our paintball attire ever since that summer. Now you are probably thinking something like this: "That is stupid to play paintball in shorts and a tank top". You are right. Its not the smartest thing that we can do but it is so fun! This year was even better because one of my friends Kurt Johnson is working up at Hume and he brought his Go Pro on the paintball field and made this video. Make sure to watch it all the way through so you can see how my armpit it bleeding at the end!